People say Grimaldi's has the "best pizza in Brooklyn." There's no question that this is good pizza. Even, sometimes, excellent. And Grimaldi's Pizzeria in DUMBO seems to be in every guidebook to New York. It's strategically located right beneath the Brooklyn Bridge, and the lines of tourists and others waiting for a pie are a testimony to Grimaldi's popularity. Grimaldi's is located in a historic DUMBO bank building that has a nice garden. In the summer it will seat up to 125 people. But be forewarned. There's usually a long line of people waiting for a table at Grimaldi's, as a tsunami of tourists keeps pouring over the Brooklyn Bridge. The pizzeria is located at 1 Front Street, on the corner of Fulton Street and offers valet parking. You can call (718) 858-4300. The hours are Monday - Thursday, 11:30 a.m. to 10:45 p.m.; Friday 11:30 a.m. to 11:45 p.m., and Saturday and Sunday, noon to 11:45 pm. 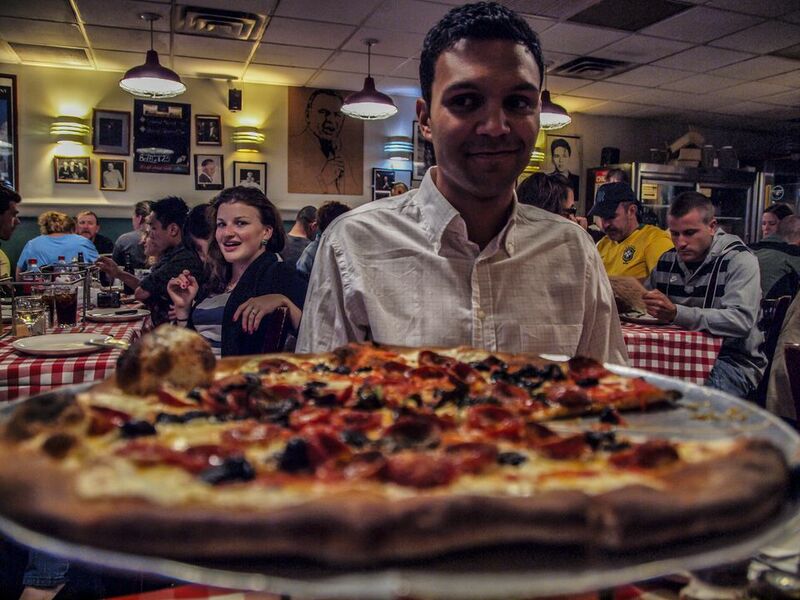 Here's the deal: At Grimaldi's, they serve pizza: Pies only, no slices. Also: No reservations. No credit cards. And no nonsense. The menu is equally concise. There's a choice of basic pizza toppings. You can order one kind of antipasto; soda, house wine or beer, and a few desserts. Grimaldi's is a basic pizzeria—but one with a reputation. Like Grimaldi's menu, the restaurant decor is modest, simple and focused. The tables are covered in traditional red-checkered tablecloths. Grimaldi's success has been due to the excellence of their pizza, their location in a spot increasingly popular with tourists—and the relentlessness of their marketing. The One Front Street building is an old bank with a movie-worthy facade. But inside, the two-story structure has defied other restauranteurs who've tried to make it a success. People go nuts for Grimaldi's pies, which come in either six or eight-slice sizes. And yes, one person can eat a whole pie, because Grimaldi's makes very thin crust pizzas, with light cheese and good sauce. The crusts are delicately burned, and they are served just-out-of-the-oven hot. Pizza pundits rave about the fine balance of those pizza basics: crust and crunch, sauce and cheese, the yins and yangs of 'za. Some New York City pizzerias turn out ten-ton slices of pizza, laden with cheese and sauce. Grimaldi's pizza travels light. What's the secret to Grimaldi's success? They boast of "fresh ingredients, handmade mozzarella, ‘secret recipe’ dough and pizza sauce." And shhhh.. even their fresh tomatoes, it's rumored, are imported from Italy. And then, of course, there's Grimaldi's coal-fired oven, which burns many dozens of pounds of Pennsylvania anthracite daily. The pizzas come in two varieties, regular or white (white meaning without sauce) and in two sizes costing $14 - $18 and up. About a dozen different toppings—including basil, garlic, extra sauce, mushrooms, Italian sausage, pepperoni, and ricotta cheese—cost an additional $2 - $4 per topping. Patrons can order a soda, a handful of standard bottled beers, or house wine. If Grimaldi's is a mom-and-pop pizzeria, it's one that's spawned quite a family. Grimaldi's today has expanded across the United States. There are Grimaldi pizzerias in Manhattan, Long Island, and Queens, plus a few more in Jersey. There are eight Grimaldi pizzeria locations in Arizona, nine in Texas, four in Florida and Nevada. With 46 Grimaldi’s Pizzeria restaurants in operation now, they are eyeing the international market. It's Brooklyn institution with a national and international reputation, one of Brooklyn's pizza ambassadors. Fans can order Grimaldi's tee-shirts. You can take the pizzeria out of Brooklyn, but that doesn't mean you can take Brooklyn out of the pizzeria. As it turns out, there's some saucy old-Brooklyn pizza dynasty history attached to the 2011 move by Grimaldi's from its former successful home in DUMBO to the new location in DUMBO on Front Street. The two restaurants are about 600 feet apart. As reported in the news media, Grimaldi's moved from its original Fulton Street site to the nearby empty building at One Front Street following an acrimonious rent-related dispute. Annoyed, the Fulton Street site's landlords got in touch with a previous tenant, who came out of retirement after a decade or more to revive his former business, started in that same Fulton Street location. He's 80-year-old Patsy Grimaldi, one-and-the-same pizza man who years ago sold his pizzeria—including the Grimaldi name and coal-fired oven—to the current owner of Grimaldi's. Meanwhile, a certain amount of drama arose over whether Grimaldi's would be able to continue to turn out fabulous coal-fired over pizzas; New York City environmental laws disallow the construction of new coal-fired ovens, and the old, 25-ton oven was left in-situ at the old joint. However, the City did grant a rare permit for Grimaldi's to build a new coal-fired over in the new restaurant on Front Street, convinced, perhaps, by the touristic value of a pizzeria with an international reputation. Together, the two coal-oven pizzerias—Grimaldi's on Front Street, and Juliana's, run by the original Grimaldi himself, on Fulton Street, a half-block away, had the capacity to serve about three times as many people as before. Even so, lines are to be expected.